Boulder Movement (BM) is a bouldering gym in the heart of the CBD in Singapore, catering to both beginners and experienced climbers. I’ve had the pleasure of designing and painting a wall mural in time for their first year anniversary in August. “Climb to a better you” resonates with me deeply. Since I discovered my love for bouldering as a sport, I have become fitter physically and mentally, which helped translate into better results in my different endeavors. And so I really felt that creating this piece for Boulder Movement would serve as a good reminder for everyone to always look to becoming their own better versions. There is a black wall of opportunities. Entering the gym, my eyes were immediately drawn to the black column in the middle of the space. Being biased towards the black and white look akin to chalkboards, I felt a tingling sensation the first time I went in the gym, and have been eyeing that wall ever since. There’s so much you can do with a blank space. Then one day in late July, it just happened. The BM crew agreed to let me design something on the wall. And so, the work began. Learn the branding and design the proposal. Each brand has their own branding guidelines. I got the branding packet from the BM team and took cues from the gym aesthetics and installations. From what I gathered through discussions and observations, I decided to go for a simple layout. Using a sans serif style helps emphasize the message, because it’s straight to the point and unassuming. While the BM branding use a lot of small letters, we decided to use all caps for this project. With these in mind, I prepared 3-4 variations, playing around with the colors and shadows, and made a proposal. The team voted on their choice and it was unanimous. Designs proposed to BM team. 1st photo from the left was selected. Mockups submitted to BM team. Middle photo was selected. Shop for materials and paints. After the design was selected, I sourced the materials (brushes, painters tape, drop cloths, etc.) and browsed through paint catalogues. 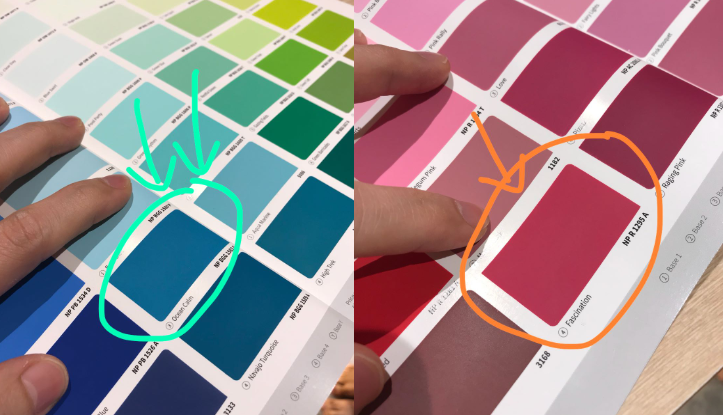 Selecting paint colors was probably the most fun I had during the shopping process, because I have always been interested in house-related things (from visiting open houses to spending hours in IKEA). But I digress, the point I’m trying to get at is - it’s important to get the right tools for the right purpose. Having different brushes of varying sizes and using the right paint is essential for mural work. While some artists swear by acrylic paint, I selected interior paint for this project. A big lettering piece like this requires a lot of planning, and a huge part of it is in ensuring that each element is measured and scaled properly. From Procreate, I transferred the design to a pencil sketch on a sheet of printer paper. I then measured each line, space and letter; and performed some mathemagic using ratio and proportion to convert the design from a scale in centimetres to meters. This step is absolutely essential to a large-scale lettering success. And this is especially true if you don’t have a projector or a lot of experience with painting murals. On the day of the mural painting, cover all the surfaces that need to be paint-free. Line the drop cloth on the floor, and tape the boundaries. Translate the measurements on paper onto the wall, and start painting. All I can remember is how relaxing the painting process was. It’s an immersive experience, with everything around me slowing down. I love how it feels. 10 hours just flew by. And that’s it! You may watch the process video below.